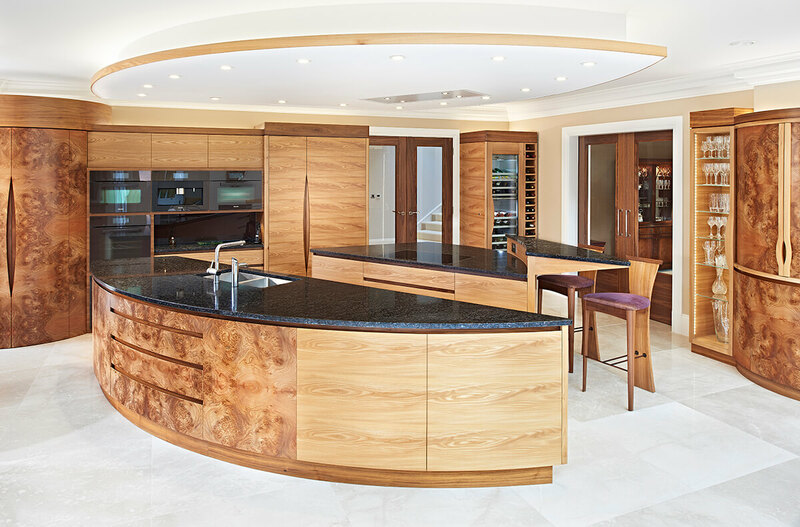 Our latest kitchen is our most spectacular and complex yet; it has two islands, a drum walk-in larder, stunning elm, burr elm and walnut timbers, a rare and beautiful stone worktop, and if it’s all too much to take in you can take a seat on one of our bespoke stools at the island bar and open up the incredible drinks cabinet. Watch the film that follows the ‘Fire & Water’ project from start to finish; from making in the workshop through the on-site fitting to the completion of a kitchen masterpiece. Well-known kitchen industry writer Gramhame Morrison’s take on the film…“All of detail that goes into this outstanding kitchen is captured in the Fire & Water video. While it is possible albeit extremely unlikely that you may see a better kitchen in 2016 (and don’t forget that this is a real kitchen in a real home), you ain’t gonna see a better video.” For the full review click here. When Simon was approached by a potential new client to design a kitchen for his substantial new-build home near the South coast, the brief was a dream: ‘to come up with something really different” for what is an enormous space by most domestic standards. Sounds simple and straight forward and with lots of space to play with it seemed the only boundaries were in Simon’s own imagination. However, to design a kitchen which is practical and beautiful as well as unusual is much harder than it sounds. Having this much space is a luxury but it needs to be managed skilfully if it is to be put to its best use. A single island in the centre of a large space can easily end up being too big to be practical – what use is an island if you can’t reach the centre of it, or if it feels like you to walk a marathon in the preparation of even the simplest of meals? Conversely, to put all the aspects of the kitchen against the walls would be to create a barn-like space with no atmosphere or ambience and is wholly impractical. Other designers had been in and come up with just that, a single large square island and a wall of floor to ceiling cabinetry containing most of the appliance. Nothing wrong it that, but the clients were looking for a more creative solution. The answer, it turns out, is simple – two islands; practical, beautiful and unusual. 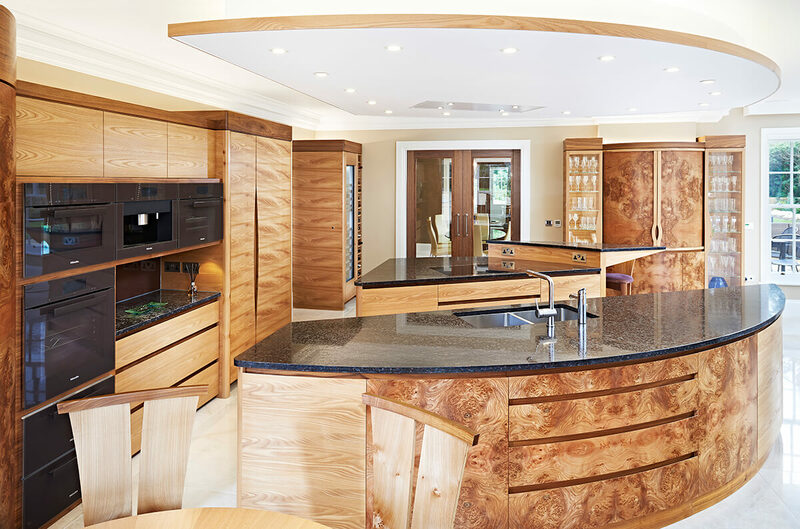 Creating two islands which complement each other and work in harmony with the rest of the kitchen was the next challenge and it was the third or fourth attempt at drawing them which was to whet the client’s appetite. Inspired by the concept of Yin and Yang, the design grew from the separation of the two key elements required in the preparation of food – fire for cooking and water for cleansing. The islands run at an unusual 30 degree angle to the back oven wall. Opening out and creating a clear route to the glazed ‘orangery’ living space via the drinks cabinet and island seating. It was always conceived as a very open and sociable space, allowing the activities of work and conversation to happen very naturally. There is also a nautical ‘boat’ feel to the shapes of the islands, emphasised by the dropped ceiling canopy which floats over the centre echoing the forms and looking like it’s heading out to sea; very apt considering the location on the South coast and the client’s interests. The elm trim around the canopy helps that illusion of floating, especially in the evenings with the gentle wash of warm led lights in the alcove above. In this big space it’s hard to get the sense of scale; the ‘Water Island’ alone is nearly four and half metres long. 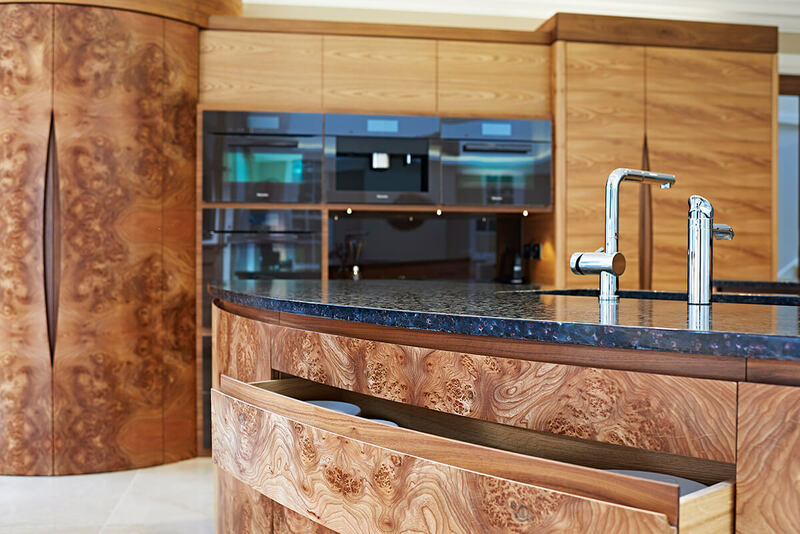 Along its straight, inner edge, it contains all the water services: sink, hot water tap, integrated dishwasher and waste disposal unit, as well as plenty of practical kitchen storage, drawers and even some specially designed bespoke trays. 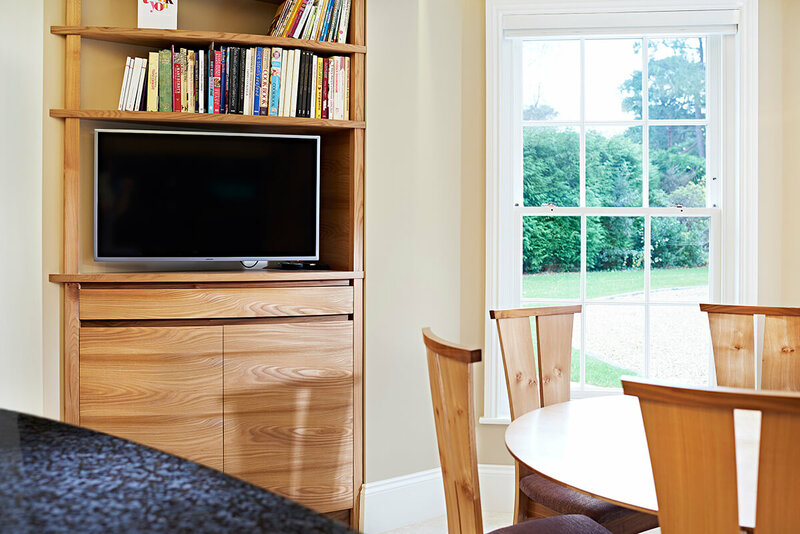 The outer curved side incorporates a feature burr sideboard with cupboard storage as well as cutlery and crockery drawers, effectively serving the kitchen dining table. The ‘Fire Island’ is shorter because of the angle it sits to the back wall. It contains pan drawers, general storage, the all important induction hob flush, to the granite worktop, as well as the cantilevered raised bar area to seat two. There is no wasted space anywhere in this kitchen, every centimetre is efficiently put to use. Although it is the islands and canopy that immeditely grab the visual attention, the backdrop of the oven, coffee, fridge-freezer and larder wall units gives balance to the space behind. We were determined to make this run of wall units full of appliances exciting to look at with varying elevation depths, lit recesses, curves and different height cornices. The run starts on the left with the feature curved drum larder unit. It’s a real ‘tardis’ inside those big burr elm doors. 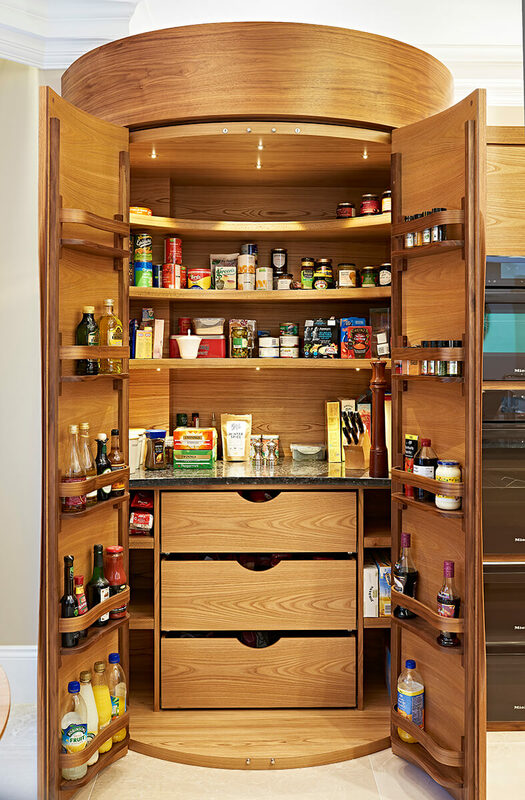 As they are opened, the internal LED lights come on to reveal vast amounts of storage on shelves and in deep drawers. There are also adjustable racks on the backs of the curved doors for more bottles, jars and spices. All the dry non-perishable, food items are in one place at the heart of the kitchen. The central element of this run contains all the ovens, large pan drawers, the coffee machine and a deep, lit alcove and work-surface to line up the coffee cups or put a hot roasting tin straight from the oven. Added interest is created by arranging the Miele appliances in an ‘L-shape’ configuration. To the right of this wall run is the fridge and freezer cabinet. There is only so much you can do with the fridges and freezers; they are big ‘lumps’ to be blunt. We did what we could to soften the hard shape of integrated Gaggeneau units adding detail with the scalloped walnut door handles in horizontal elm panels. The wine cooler which stands to the right of the main double doors into the kitchen is also a top of the range Gaggeneau. Like Miele it is a beautifully made and engineered German appliance that doesn’t disappoint. The wine fridge again is integrated into our cabinetry. Its bulk is visually softened by the glass door and our treatment of the cabinet, but it is still an imposing piece in the corner of the room. We had space to incorporate a rack for 2 further cases of wine. After all, you can never have too much wine storage! 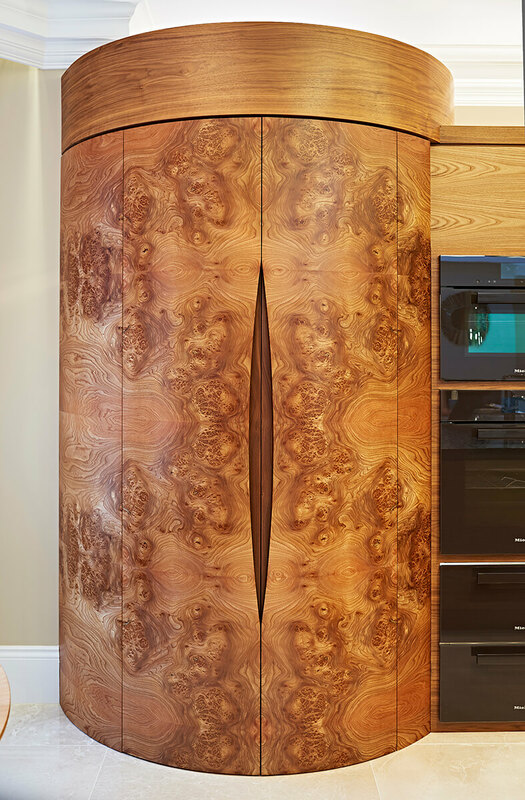 We have used the burr elm on the 3 feature pieces in the room – the sideboard element in the ‘Water’ island, on the drum larder and finally on the large display and drinks cabinet. This is a real ‘piece of furniture’, a big statement piece which in the large space looks well proportioned. It contains a beer and mixers fridge in the bottom section, lit glass display sections to either side, and the main drinks cabinet behind curved sliding tambour doors in the top middle section. We all love this piece because it is quirky, striking to look at, but also technically a challenge to make. 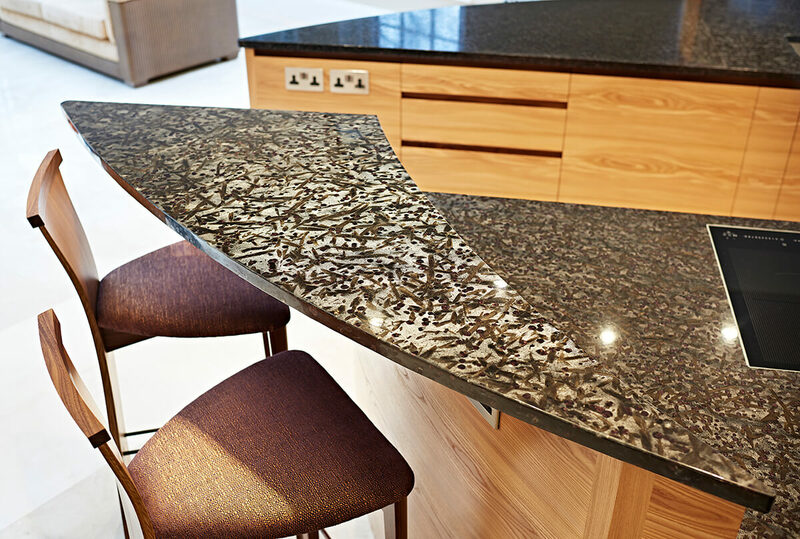 It’s just a step away from the raised bar on the ‘Fire’ island where you can perch on one of our ‘Guinness & Murphy’ stools and talk to people while they work in the kitchen. 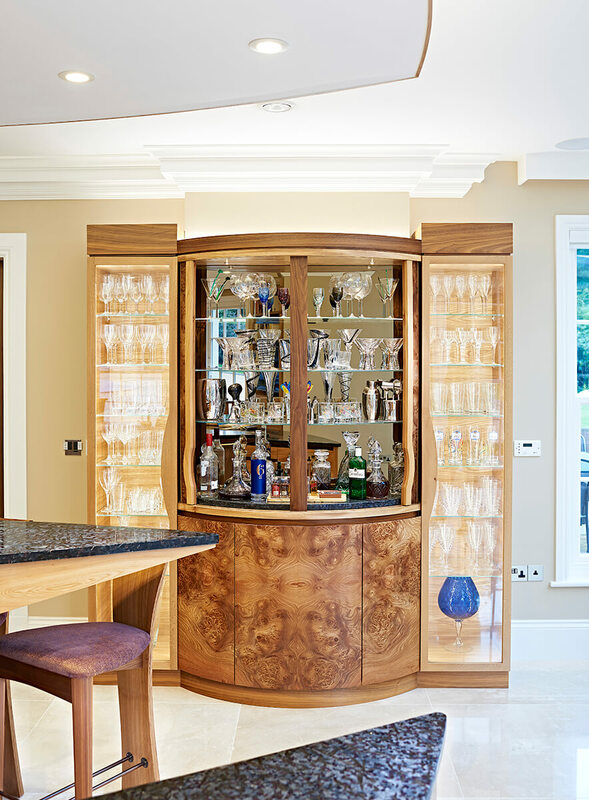 We have produced lots of bars, cabinets and drinks related furniture over the years, in fact there is an article here on the STP blog dedicated to it! The final element is the kitchen dining area. We made a set of 6 ‘Gabriel’ chairs with seats covered in lovely woven purple and gold fabric which beautifully sets off the elm and walnut. We made the table top in hand cut radiating elm veneers; very simple but stunning when combined with the fluted café style metal base. This, along with the foot frames of the stools, was bespoke bronze plated, and they all look incredible. This was very much a whole room solution rather than just a kitchen. It is designed to echo with the client’s lifestyle, interests and needs, with the social aspects as important as the practical working needs of a kitchen. Our clients are completely delighted with the project. During the photo shoot one of them said to me, “We love our kitchen, is so beautiful and yet so practical.” As designers and makers of very bespoke kitchens we know we’ve done our job when we hear that. 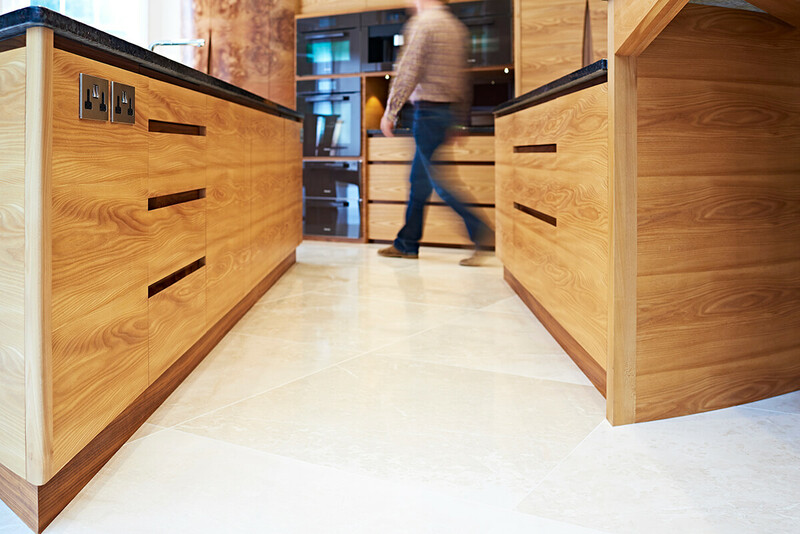 The best kitchens come out of a successful collaboration between client and designer. That takes time and effort, but it will be worth it! If you’d like to talk to Simon about a kitchen project in Dorset or the UK please get in contact, initial conversations and ideas cost nothing. 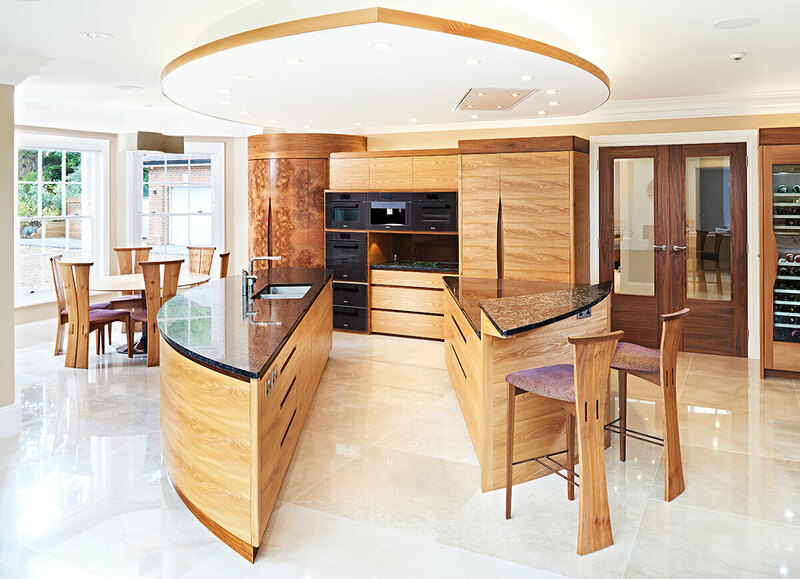 For more of our kitchen case studies click here.